The Bigg Boss 11 runner-up, Hina Khan never misses the opportunity to make a statement. Nowadays, she is raising the heat with his boyfriend Rocky Jaiswal on beaches of Goa. Her recent monokini picture reminds us of her fellow contestant Priyank Sharma as he wore the monokini during a task in Bigg Boss 11. Recently, Hina Khan uploaded a beachwear picture on her Instagram handle and everyone was drooling over her. After sometimes they realized, the monikini that Hina was wearing in the picture is the same that Priyank wore inside the Bigg Boss house. Priyank also made hilarious comments about the monokini. He said, “I should try this one too”. 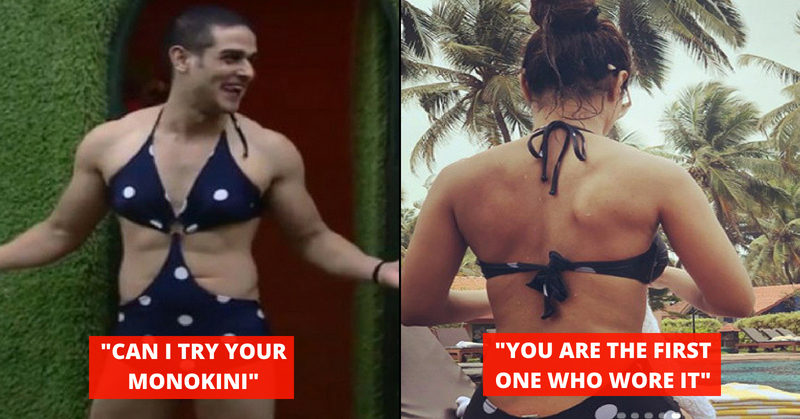 To which Hina replied, “you are the one who wore it first and I am the second.” The monokini moment of Priyank Sharma in Bigg Boss was utterly hilarious. Moreover, it was hard to forget about that. These pictures of Hina Khan has refreshed that hilarious moment from Bigg Boss. In the season 11 of Bigg Boss, Hina Khan made a statement with her fashion sense and style. There were some controversies about her being a style icon as a renowned stylist claimed that she was wearing borrowed clothes in Bigg Boss house. We are not aware of the reality of this statement but one thing for sure. The way she carried the clothes and pulled off glamorous look was remarkable. That grabbed all the eyes. Looking at her boosting popularity, she is one of the most wanted celebs nowadays. Time after time Hina Khan ignites the social media with her hot clicks. Recently, she appeared in the video of a Punjabi song with Singer Sonu Thukral. Titled as Bhasoodi, the song is directed by Robby Singh. The video of the song has been shot in Patiala Punjab. What do you say about this one? Share in the comments.